If you’re fortunate enough to know someone who loves to bake, you’re probably one of the lucky ones who gets homemade sweets and treats from them during the holidays. If you’re Patty Kincaid’s friend, you’re one lucky soul! She only bakes once a year, and only these mouthwatering buttery tart Lemon Squares, the recipe that friends and family wait for all year. Patty, who is a Scottsdale resident and media consultant/recruiter, shares with us her delightful story: “This recipe comes from Overland Park, Kansas circa 1966. My best friend from Queen of the Holy Rosary grade school was Lynda Hermes and her mother, Virginia, shared this recipe with me. The recipe card I use is printed in 2nd-grade handwriting, is smudged and dog-eared, but still does the job. These lemon squares come out only for the holidays and are definitely a labor of love for me at Christmas. I used to bake a variety of treats but the Lemon Squares seem to be the favorite. I joke with my friends that you only get a few so you don’t have to share!” Well, this year, I only got a few. And I’m not sharing. But now you have the recipe–even better. Thanks Patty! Keep the yummy tradition going! Preheat oven to 350 degrees. Combine 2 cups flour with 1/2 cup powdered sugar and set aside. Pour melted butter into a 9x13-inch baking dish (metal preferred). Stir in flour and powdered sugar mixture. With a fork, mix until well combined, creating a dough. Press evenly with your hand to form a crust in the bottom of the pan. Bake for 20 minutes. Meanwhile, beat together eggs and bottled lemon juice until fully combined. Just before the crust comes out of the oven, to the egg mixture add 2 cups granulated sugar, 4 tablespoons flour, salt and baking powder. Blend with a electric mixer on medium until combined. Pour over hot crust. Bake for another 25 minutes. Let cool. 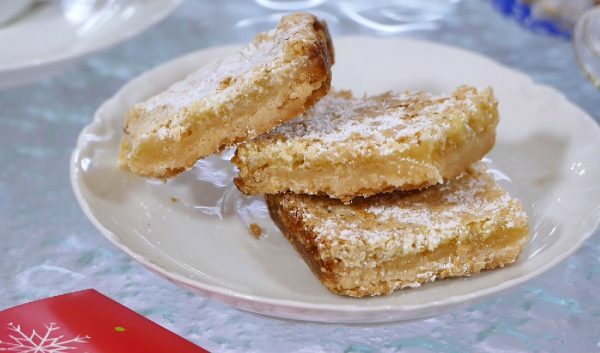 Cut into squares and dust with powdered sugar to serve. Squares can be covered with foil and refrigerated or made ahead and frozen in a well-sealed air-tight container. Makes approximately 24 squares. *Jan's Note: I was curious as to why Patty preferred bottled lemon juice to fresh-squeezed. Research in my cook books and on line revealed that many pastry chefs prefer bottled lemon juice simply because of consistency. Some lemons are less tart and "lemony" than others, and bottled lemon juice provides the exact amount of tartness every time.